The Ms. Oklahoma Pageant is administered by the Ms Senior Oklahoma Foundation under the direction of State Administrator, Ladell Maxwell, and her team, the volunteers of Ms Senior Oklahoma Foundation, for their hard work and commitment to the Age of Elegance! The 2019 Ms. Senior Oklahoma Pageant will be held at the Fine Arts Center Ataloa Theatre East Central University 1100 E. 14th Street Ada, Oklahoma Saturday, June 29th, from 2:00 - 4:00 pm. For more information, visit Ms Senior Oklahoma on facebook or contact ladellok at yahoo.com and make your plans to be inspired! 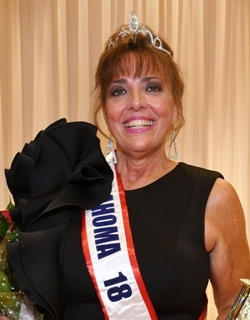 Congratulations to KAY MANNING, Ms Oklahoma Senior America 2018 and to the Ms Senior Oklahoma Foundation for a wonderful State Queen! Kay is a spirited born and bred Oklahoma Potawatomi Nation Native American and Sooner fan. She is a Pre-K teacher and loves that she is able to keep influencing and educating children to the best they can be. Kay has one daughter named Brooke and two beautiful grandsons named Peyton and Bivin that keep her young. Kay looks forward to all her 60�s have in store for her. Kay is very active in the community with her school, Church, and senior community. She has been in the Senior Follies for the last three years and was honored to get to be a part of the Ms. Oklahoma Senior America pageant for the first time this year. In her school, community she is involved in the P.T.A, as well as, the Faculty Advisory Committee, School Leadership Committee, and PBSI Committee. In her Church community Kay is a Lector at both Mercy Chapel and St. Eugene�s Catholic Church. Kay volunteers regularly at her Church by being a lector at two different churches in Oklahoma City. She is a Representative for United Way, and is passionate about donating to Goodwill and YWCA. Kay is also involved in her schools P.T.O /P.T.A boards. Throughout the year Kay helps call BINGO, assist in school carnivals, Math Night, Literacy Night, and coaching the students for the Talent Show. Some of the things that Kay likes to do include singing, acting, dancing to Disco, playing Volleyball with her family, and swimming. Kay has two grandchildren that keep her busy going to sporting events, school functions, and volunteering in her grandson�s class for different events. Kay also loves Karaoke and listening to live music. When a good show is in town, Kay loves to get to get tickets to musicals, plays, and concerts. Kay has worked for Oklahoma City Public Schools for the last 23 years and has enjoyed getting to shape the young minds of the future. She has taught everything from pre-k to second grade, except first grade. Kay won teacher of the year in 2016 for Rancho Village School and also won 1st place for her 2nd grade students having the highest Math scores in the state. Life since turning 60 has been a blast for me, and keeps getting even better! I truly feel I�m starting a new chapter in my life, and feel like it could be one of the best one�s yet. I have come out of my shell and am enjoying getting out there and performing again. Kay�s philosophy of life is �If you give a man a fish you feed him for a day, if you teach a man to fish you fed him for life,� because as a teacher she wants her students to know what it takes to go out there and succeed, as well as, be independent. Another philosophy of my life is �God First,� because without him none of this would be possible and I wouldn�t have met so many amazing people along the way.